This is a very common style of infill housing in the city - a boxy facade with flat roof which provides a roof top deck. This one seems to be clad in copper panels which will look great after they have weathered. Hello, this is a love-hate thing for me. 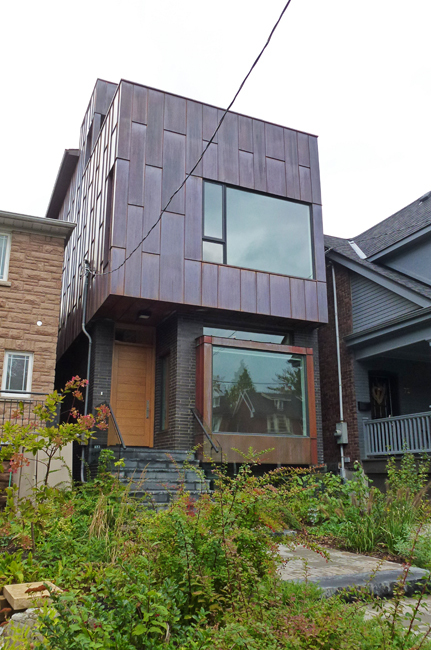 I like the modern look, but squeezed in the older homes it looks out of place. Happy Thursday, enjoy your day! I like the way they squeeze these little properties in. I had never heard of infill housing until you introduced the concept to me. Always glad to learn new things! I like the look of it. And, as always, I'd love to see how the inside is set up. Wow, that's tight. Can you even get in between the houses? I guess if they built it, someone had to squeeze in there. I have to agree with Eileen' s comment. Maybe when it's weathered it will be more attractive. We see it here too, and they often clash badly with the century plus houses around them. Interesting. I'm not sure I would like being squeezed in like that, but the rooftop deck would be nice. I think these are rather cool. And I love the idea of a rooftop deck but I especially love those huge windows in front. They use this style of housing in California, too, along the beach areas where there's very little land to build anything. ...and you can call out the window and say, "Pardon Me, Do You Have Any Grey Poupon?" It has it's own style and it stands out nicely! Are there three houses here? A tight squeeze but it looks grand. I like it plus I would love to see the roof deck. Maybe some nice views from the roof too. "in-fill housing" is a new term for me. Obviously it is a creative use of space. I like it! Me gusta Pat es muoderna. I think this one I would like. Infill housing makes good economic sense, and my feelings about the architecture is that, if it can't be made to be sensitive to the nearby home, at least make it enough different and good looking that the deviation from the neighborhood style will seem intentional and intelligent.